​(CHICAGO, IL; August 25, 2016) Chefs John Shields and Karen Urie Shields are thrilled to announce that their West Loop restaurant Smyth will open tomorrow, August 26. Smyth is their tasting menu concept, a fine-dining compliment to neighborhood restaurant and barThe Loyalist housed downstairs. 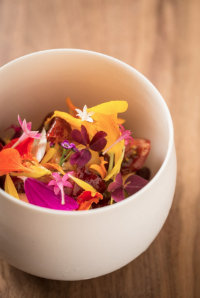 The husband and wife duo bring experience from Charlie Trotter’s and Alinea, returning to Chicago after a successful run with their rural Virginia restaurant Town House. Smyth draws its name from the small Virginia county in which they opened Town House, and its menu reflects that same dedication to the integrity of an ingredient as well as seasonality. This dedication led them to partner with a local farm in Bourbonnais, Illinois to source many their ingredients, working closely with the farmers to curate a variety of heirloom and hard to find varieties of herbs, fruits, and vegetables. These ingredients are then carefully incorporated throughout the menu with seemingly familiar flavors presented in an entirely unfamiliar way. The experience at Smyth is a confluence of warmth, vitality, and artistry; from the friendly greeting from chefs through the open kitchen to the humble approachability of the sommelier and the relaxed, comfortable nature of the dining room. Johanneshoff Reinisch. The wine program will be focused and seasonal which will allow the list to change and develop with the menu, with whites and lighter-bodied reds in the warmer months moving into more robust and fuller-bodied whites and reds in the colder months. Head Bartender Roger Landes will curate a list of vintage spirits like Campari and other Italian liquors which will also be incorporated into beverage pairings. The spirits program will further develop later this year with a full-service bar cart serving these pours as well as seasonally-focused cocktails. Smyth is housed in a striking venue on Ada St. in Chicago’s West Loop neighborhood, covered in lush ivy with a small garden out front sprouting herbs and edible flowers. The upstairs space boasts floor to ceiling windows with exposed brick, rich wood ceilings, and other elements that preserve the integrity of the building. Walking into Smyth, guests will feel almost as if they’ve stepped into a good friend’s home, with oriental rugs, plush seating, and warm lighting, save for the massive open kitchen that connects the guest with those creating their meal. The massive open kitchen takes up almost half of the room and showcases a crackling wood-fire hearth as well as an uncommonly large pastry station for Chef Urie Shields to create the restaurant’s desserts. The room features custom lighting from ceramics artist Lilith Rockett who was also commissioned to create plates and bowls for the restaurant. The restaurant accepts reservations via Tock for the tasting menu experience Tuesday-Saturday 5:00-10:00 p.m. Guests who are unable to make reservations at their desired date or time are encouraged to try The Loyalist downstairs which welcomes walk-ins.